In our last episode, Dr. Byrds & Mr. Hyde, I mentioned that I would probably exit the Byrds bandwagon at some point. This is where I get off. 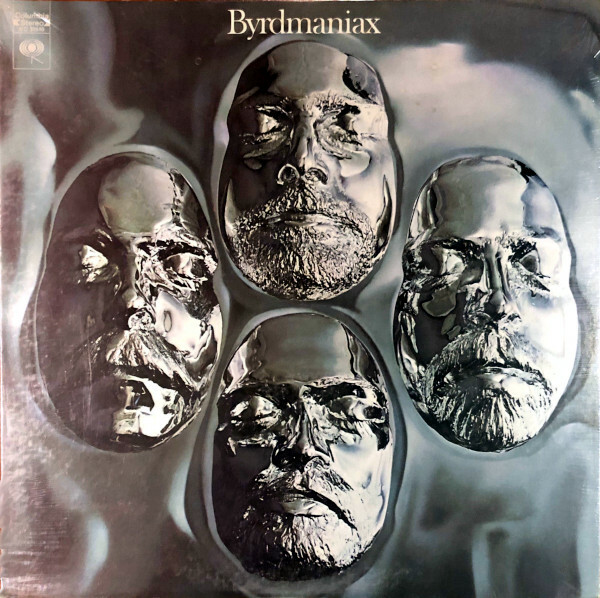 Byrdmaniax is one too many eclectic albums with lousy covers, bad titles and nearly nothing to do with the original Byrds. Neither did Sweetheart of the Rodeo, I suppose, but I loved that title. The trouble with Byrdmaniax is two-fold: the band didn’t bring great material to the studio to begin with, and the producer (Terry Melcher) brought in an orchestra and backing vocalists to embellish what he (probably rightly) felt was an underwhelming collection of songs. The Byrds were apparently mortified when they heard the final mix, and promptly disowned it. Unfortunately for their fans, disowning a record you’ve already paid for and played is a bit trickier (or at least was back in 1971, before Amazon magically waived buyers of all responsibility). The album opens with “Glory, Glory,” a gospel song given a folk-rock treatment from McGuinn and the band, that is partially returned to its original gospel roots through the addition of a female choir. “This Wheel’s On Fire” it ain’t. “Pale Blue,” written by McGuinn and Gene Parsons, is one of the album’s highlights, a pretty acoustic number that gets buried by overproduction; an acoustic version included on the Expanded Edition is far superior. “I Trust,” based on McGuinn’s own personal, positive outlook (as borrowed from Norman Vincent Peale) is another winner, though again Melcher and arranger Paul Polena do the band no favors. What follows are a pair of tracks written by Skip Battin and the sinister Kim Fowley that have absolutely nothing to do with The Byrds. “Tunnel of Love” is easily dismissed as a hackneyed melody married to cryptic lyrics, but “Citizen Kane” is harder to shake. It’s an image of Hollywood excess, a sort of hell on earth (a not unfamiliar theme for Fowley) set to an ingratiating music hall melody, as if a psychedelic American rock band were trying to be The Beatles or The Kinks circa 1968. “Absolute Happiness” falls into that strange category too, and you have to wonder if Battin hadn’t wandered into the wrong band. The songwriting partnership between McGuinn and Jaques Levy leads to more predictable results. “I Wanna Grow Up To Be A Politician” isn’t as clever as it thinks it is, but “Kathleen’s Song” is perhaps the prettiest song on the whole album (it would come down to this or “Pale Blue”). At the other end of the creative spectrum, Clarence White co-authors the banjo/mando/fiddle fireworks display, “Green Apple Quick Step,” and cherrypicks two covers to sing, “My Destiny” (which is mugged in the final mix) and Jackson Browne’s “Jamaica Say You Will,” a song that Browne himself would release on his debut in the following year. The Byrds have always benefited from the different creative personalities in the band. Skip Battin, however, is no David Crosby, and Clarence White is no Chris Hillman. Musically, you could make the case that Gene Parsons is a better drummer than Michael Clarke, or that Clarence White is a better guitarist than Gram Parsons, but the group’s creative spark is here dampened by too many different musical directions and not enough genuine inspiration. * Credited to McGuinn alone on the original elpee. Skip Battin (bass, vocals), Roger McGuinn (guitar, vocals), Gene Parsons (drums, harmonica, banjo, vocals), Clarence White (guitar, mandolin, vocals) with Byron Berline (fiddle on B3), Merry Clayton (backing vocals on A1), Sneaky Pete Kleinow (pedal steel guitar on A3/B4), Larry Knechtel (piano, organ), Terry Melcher (piano on A3), Paul F. Polena (string/horn/choir arrangements, piano overdubs), Jimmi Seiter (percussion on A4/A5/B2), Eric White, Sr. (harmonica on B3). Co-produced by Terry Melcher and Chris Hinshaw; engineered by Chris Hinshaw, Eric Prestidge & Glen Kolotkin. Released on elpee on June 23, 1971 in the US (Columbia, KC 30640), on August 6, 1971 in the UK (CBS, S 64389), and in 1971 in Japan (CBS/Sony, 20AP-2201) with gatefold cover; reached #46 on the US charts. Re-issued on compact disc in 1990 in Germany (Coline, CLCD 9.00930). Re-released as 20-bit remastered Expanded Edition in 2000 in Austria (Columbia Legacy, 495079 2) with 3 bonus tracks.